Sunshine Landscapes chooses and installs hedges, bushes, shrubs, and other screening plantings including evergreen hedges, bamboo fencing, and more. We also maintain your plantings, and divide and transplant when needed. We'll come by and discuss a plan with you, and determine your needs based on your soil, light exposure, and what kind of coverage you want from your plantings. From a simple butterfly bush to rows of bamboo screening, evergreen plantings or evergreen screening, or an extensive boxwood hedge, Sunshine Landscapes has got you covered! 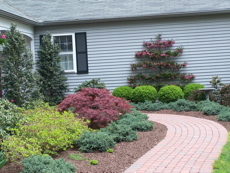 Sunshine Landscapes can be your pruning and trimming professionals  call us today for a consultation!